Two parents reunited with their now-married lost daughter after a 24-year search on Tuesday. 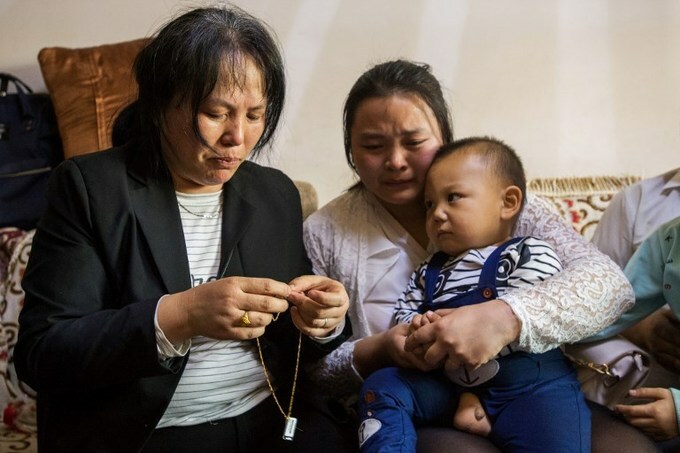 A tearful reunion between parents and their missing daughter after an agonising 24-year search has put a spotlight on the vexed issue of child trafficking and disappearances in China. Wang Mingqing and his wife Liu Dengying, from southwest Sichuan province, lost their three-year-old daughter in 1994 when she vanished after being momentarily left alone at the family's fruit stand. "I looked up and down the street, crossed the bridge, looked everywhere. She was nowhere to be found," Wang told the official Xinhua news agency. The couple gave up their fruit business for several years to focus on their search, soliciting the help of local police and welfare organisations. But the efforts were in vain and their daughter became one of the thousands of children that go missing in China every year, often kidnapped and trafficked by illegal adoption rings. Refusing to give up, Wang became a taxi driver in 2015 in the forlorn hope of one day picking up a passenger who might miraculously turn out to be his daughter. And then a breakthrough. Earlier this year, a woman living thousands of kilometres away in Jilin province contacted Wang after spotting a sketch of what his daughter may look like today along with the family's story on the internet. Results of a DNA test confirmed that the woman, Kang Ying, is Wang's lost daughter and on Tuesday the family had an emotional reunion in the city of Chengdu. "From now on, dad is here. You don't need to worry about anything... Daddy never forgot you, never stopped searching for you," video footage of the event showed a tearful Wang telling Kang. His two other children, a boy and a girl, had prepared signs saying "sister, we missed you" to greet Kang, who is married and has a son and daughter. "The whole world told me I didn't have a real (biological) mother - but I do!" she was quoted as saying by the local news website thecover.cn. Unaware of her origins, Kang said she had lived as a child with her adopted parents, less than 20 kilometres (12 miles) from Wang's home in the same county. The story made waves on social media, with dozens of parents sharing information about their search for missing children. A missing persons alert system launched by the Ministry of Public Security in May 2016 has broadcast information about 2,767 missing children and managed to find nearly 2,700 of them as of March 15, data from the ministry showed. But many more are believed to be abducted each year and sold to underground adoption agencies. In the past, China's one-child policy -- which expanded to two in 2015 -- and a preference for sons fuelled the trafficking of children. "To reduce the red-tape and time required to go through the formal adoption process, an underground network of kidnapping gangs emerged to accommodate those who are willing to pay more," Matt Friedman, a former UN regional manager of anti-trafficking in Asia, told AFP. "Most couples who adopted from these networks didn't know that the infants they brought home were stolen from hospitals or communities," Friedman said. Wang told thecover.cn that during his quest to find his daughter, he met dozens of parents who had lost their children, some due to trafficking. In his three years as a taxi driver, Wang drove around Chengdu with information about his daughter on a large sign on the rear window of his cab. He also gave leaflets to passengers to spread the word. In the end, help came in the form of a forensic expert and sketch artist, Lin Yuhui, who contacted Wang after reading about his plight. Lin created a portrait of how Wang's daughter might look as an adult and helped circulate it on Chinese social media and to police stations nationwide. When she saw the image, Kang Ying contacted Wang saying she was "shocked" by its resemblance to her. "But I was sceptical at first because a few women had contacted us in the past, claiming to be my daughter," Wang told thecover.cn. "But DNA tests later disproved their claims." China is building a national DNA database with blood or saliva samples and iris scans collected from random citizens and groups. According to the public security ministry, one of the main aims of the database is to help people find their lost parents or children. But Human Rights Watch has criticised the project, saying it lacked "oversight, transparency, or privacy protections."